We offer a wide variety, including sliding bathtub doors, bathtub screens, and swinging bathtub doors. Why settle for a shower curtain that goes out of style when you could upgrade to the timeless beauty of a bathtub door? Shower curtains can get moldy and wear out over time. Plus, they tend to get dated. But a frameless bathtub door? A Dulles Glass bathtub door is sturdy and stays sparkling clean. You can customize your bathtub door to your own personal style. Just talk to a glass expert and you’ll see! There are several different types of bathtub doors. 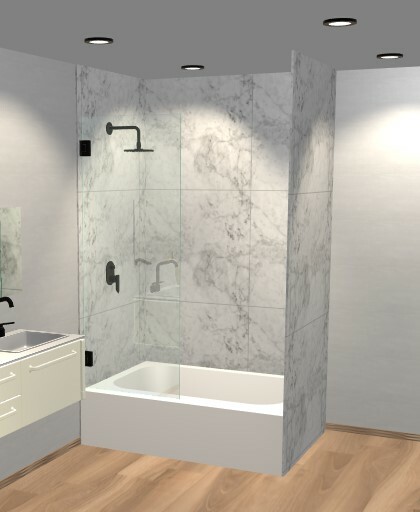 Which one you choose will depend on the configuration of your bathroom, your bathtub, and possibly other obstacles or architectural details in your space. If you’re not sure what type of bathtub door you need, a glass expert will help you decide. Sliding Bathtub doors are one of our most versatile choices. 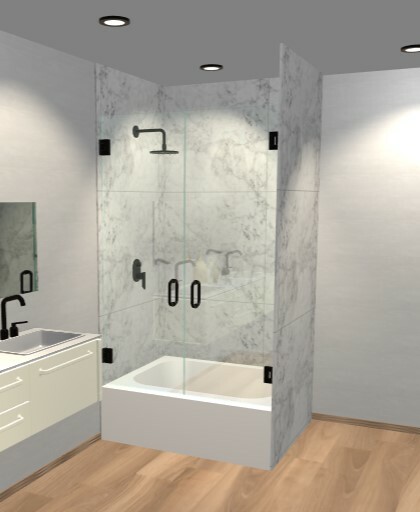 We feature three kinds of sliding bathtub doors: The Metro, Quadro, and Linear. Each type offers you a different look based on the hardware that goes with it. The Metro sliding shower door has a tubular sliding mechanism at the top, which gives you a modern look and feel. The Quadro operates on a square sliding mechanism at the top. And the Linear sliding shower door gives you a semi-frameless look that some customers prefer to the more frameless bathtub door look of the Metro and Quadro. Sliding shower doors can be installed on many existing bathtubs. One exception is claw-foot tubs. Because they are often curved, our bathtub doors might not fit over them properly. But, many homes with standard bathtubs can get a sliding shower door installed over the tub. Another great advantage of a sliding shower door is the use of space. By choosing a sliding bathtub door, you don’t really have to worry about what else is in the bathroom. Your sliding door won’t swing out and hit any obstacles, like a vanity or toilet. You can easily customize any of our sliding shower doors. For example, you can choose from three hardware options for your bathtub door: chrome, brushed, nickel, and oil rubbed bronze. You’ll also be able to choose the type of glass. These options are available for your selection during the quote process. Remember that messy shower curtain door? Cleaning is a breeze with a sliding shower door from Dulles Glass, especially if you opt to get ClearShield shower door protector. This treatment repels water and soap scum for an easy-to-clean bathtub door. Another type of bathtub door is a frameless bathtub screen. These screens can be fixed in place or swing open. Frameless bathtub screens are an easy and budget-friendly upgrade for your bathroom. Another benefit of a frameless bathtub screen is that they create a barrier for water splashing out into your bathroom. Families with kids and dogs will appreciate this splash-proof feature! 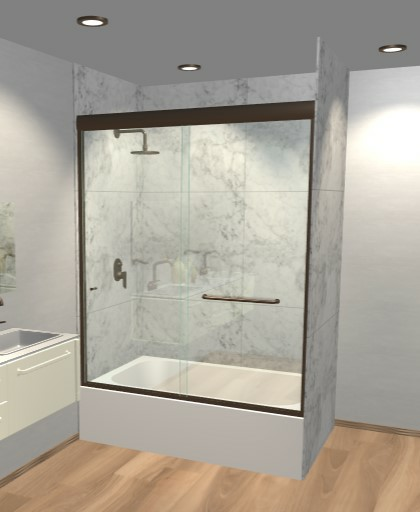 One of our custom shower door configurations is a swinging bathtub door. You can choose either a single swinging bathtub door (a swinging door and a fixed panel) or dual swinging bathtub doors (handles on both doors that open in the center). These unique configurations are perfect for the unique architecture of the Washington, DC area, where older homes are more common. They also work well in newer homes, where bathrooms might be larger to accommodate the swinging doors. 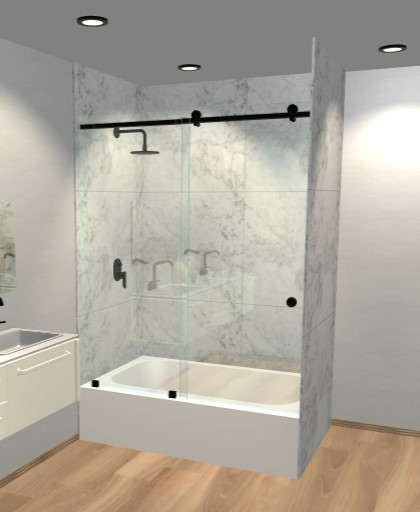 One advantage of a space-saving bathtub door is that you can maximize space in your bathtub while still getting the look of a standalone shower. Bathtub doors allow you comfort in the bathtub, when you just want to relax into a spa-like experience. You can have the candles and bubble bath, but when you’re done, you can simply turn on the shower! The glass bathtub doors will give you the look and the feel of a beautiful free-standing shower. Get exclusive offers and the latest news in your inbox! Dulles Glass – providing expert glass and mirror installation in the Washington DC Metro area, including parts of Maryland, Northern Virginia, and the District of Columbia for over 40 years.